After a day spent touring all around the city, including several walks to/from our hotel, we were more than ready for a good dinner in Reykjavik. We really wanted to try out something novel, and we had noticed that several Reykjavik joints were doing “Icelandic Tapas”, combining the concept of tapas with local ingredients. Actually, since Reykjavik has quite the fishing port, and a lot of fresh fish, this made sense. Walking around town, we settled on trying out Tapas Húsið (Tapas House), which is located adjacent to the harbor in what used to be a processing plant for saltfiskur (bacalao), which has since been redecorated in a vague nautical motif. Looking over the menu at Tapas Húsið, we noticed that they focus on tasting menus, with three main choices: Tapas from the Sea, Tapas from the Land, and Tapas from the Farmer. We ended up doing the Tapas from the Seas tasting menu, which we also supplemented with a few additional courses. We settled back with our pitchers of Sangria (they had a 2 for 1 special going on), and let them start bringing out the food. Our first course was deep-fried Langoustine (“Norwegian Lobster”, for those not familiar with it, slightly smaller than Maine Lobsters) with aioli. This was a solid performer of an opening dish: the langoustine was fresh and perfectly cooked throughout, with a pleasant breading that adhered well to the meat while not overpowering the taste or texture. The aioli was a pleasant sauce, providing a smooth mouthfeel and just a hint of garlic. The result was a light and pleasant dish, instead of a heavy deep-fried stomach bomb. I’d get this again, since we both rather enjoyed it. 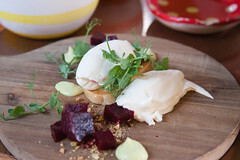 Next up was Goat Cheese and Beetroot with pistachios and cardamom. I’ll be honest, since, oh, 2007 or so, combining goat cheese and beetroot has been one of those de rigueur trendy restaurant appetizers. I’ve had it done well a few times, and done poorly even more. I’m almost sick of this particular combination, from the number of times I’ve seen it. Until this one. This was the best goat cheese I’ve ever had, and it was served up with a sparing portion of beetroot that nicely complemented the dish instead of burying it in beet flavors. Texture- and flavor-wise, the goat cheese was perfect: soft and smooth, with just enough bite to it that you know its goat cheese. I’d get this again in a heartbeat. The third course was gravlax on herb and dill rye bread. 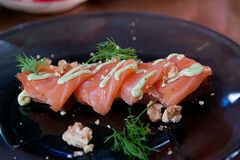 The Icelandic really like gravlax, we saw it on menus at most places we dined, and it generally was very nicely done. A bit more subtle than most of the more heavily pickled gravlaxes I’ve had in Norway and Sweden, the result here is nice little slabs of salmon where the light curing has brought out just a little bit of flavor. Add in some Icelandic rye bread (rúgbrauð: a dense and and moist dark rye bread, often cooked by steaming), and this was a pleasant little dish, having an almost nigiri sushi-like taste and texture. 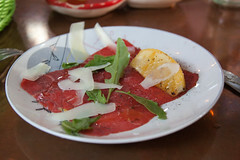 The fourth course was a nice Icelandic beef carpaccio served up with shards of manchego cheese and a roasted sugared lemon. This was a nice shout-out to the Spanish heritage of Tapas (and the manchego cheese was really good), as well as good way to showcase the quality of Icelandic beef. This was tender and flavorful, and the garnishes (the cheese and lemon) added to the meat without burying it in sharp flavors. The fifth course was the “chicken spear”, basically a mini chicken kabob cooked with a spice mix reminiscent of a good tandoori chicken. I was certainly pleased with it, there was a combination of good flavor, a good char, and some nice veggies served up with it. 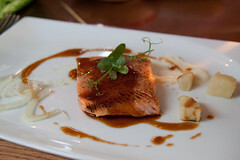 The final course was cured arctic char with parsnip. This was a nicely done piece of fish; I don’t usually see much char in our next of the woods, whereas most places in Iceland had some version of it on the menu. The fish was cooked just barely to the point of flakiness, but still having a nice crisped top to it. If there’s anything I learned in Iceland is that most everyone there seems to be able to cook fish perfectly, and this was the first good example of that. 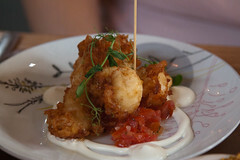 Overall, I really enjoyed Tapas Húsið. 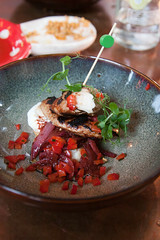 It was a nice, lighter meal, served up with good ingredients that were perfectly cooked, served up tapas style. We were certainly pleased.